In this edition of Summer Travel in New England, I am going to share with you my second most favorite place to completely unwind and a great recipe to take with you to that place. But first, some back story…. This is my friend Alicia. She is in the Roller Derby. Told ya, awesome. With boyfriend Eamon (a super talented tattoo artist), they make up one of our very favorite couples. A few years back A&E started to invite us out to Harwich for some super fun Cape weekends. 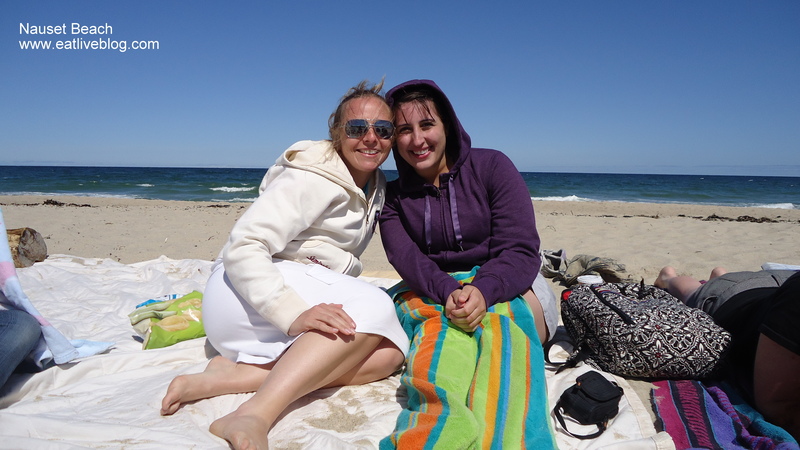 And also introduced us to one of the most beautiful beaches in the Cape, Nauset Beach. The reason I love Nauset is that on top of being a beautifully pristine beach with pretty good-sized waves, this beach is also “user-friendly”. The parking is close, Liam’s Clam Shack is there, and you only have to walk about a 100 yards from the main stairs to have absolute peace and quiet. That’s right folks, here’s the secret of Cape beaches….if you don’t sit on top of the stairs down, you can get away from the crowds. Shocking, I know. And yes, I am kicking myself for not having pictures of said beach right now. I guess I am always just enjoying myself too much to bother! After leaving a day at Nauset Beach (which is very, very hard to do! ), this area of the Cape has another surprise in store for you….The Harwich Dump. That’s right, the dump. But this is not an ordinary dump, this is the Harwich Treasure Chest! The Treasure Chest is a magical place where you can drop off things that you want to throw away, but others may get use of. You know, the whole “one man’s trash” deal… You can find everything from records, to cookbooks, to bicycles, to furniture to…. …like I said, everything! I walked away with a pretty cool cookbook, while another friend took home a board game and a dress. This place is pretty neat indeed. We all know how much I love pickles, so these Lay’s Dill Pickle Potato Chips were a great snack! In S. Africa Dill Pickle chips are as common as BBQ is here, so it is about time USA caught up with that trend! And another reason we love Alicia, she made us this fabulous pasta salad to nibble on at the beach. Packed in individual ziplock baggies with our names on them, it was quite perfect! This entry was posted in Recipes, Reviews, Travel in New England and tagged beach, cape cod, combos, dill pickle, harwich, Lay's potato chips, new england, orleans, pasta, pasta salad, potluck, recipe, recipes, salad, side dish, summer, summer travel in new england, travel, treasure chest, vacation, vegetarian, veggies by reneeh. Bookmark the permalink. My uncle loves the dump on the Cape. I always tell him it’s certainly his treasure and certainly not mine! Ha. I think he’s furnished his whole house with stuff from the dump. You have got to try Coastal Maine Popcorn’s dill pickle popcorn. SO good! You don’t even know…I am COMPLETELY obsessed with dill pickle flavored popcorn. I can’t even put it into words! Is this the popcorn place in Boothbay Harbor? If so, I have had it, and inhaled it! Their buffalo flavor is awesome as well! Hingham has a dump like that. Their trash is definitely treasure. We haven’t made it to the Cape yet but it is on the list. Thanks for sharing the tips AND the recipe. I love the waves at Nauset Beach, definitely one of my favorite Cape beaches! spent a few good days at Nauset boating and 4 wheel driving- it’s a real treat to have friends on the cape and yours sound pretty amazing! 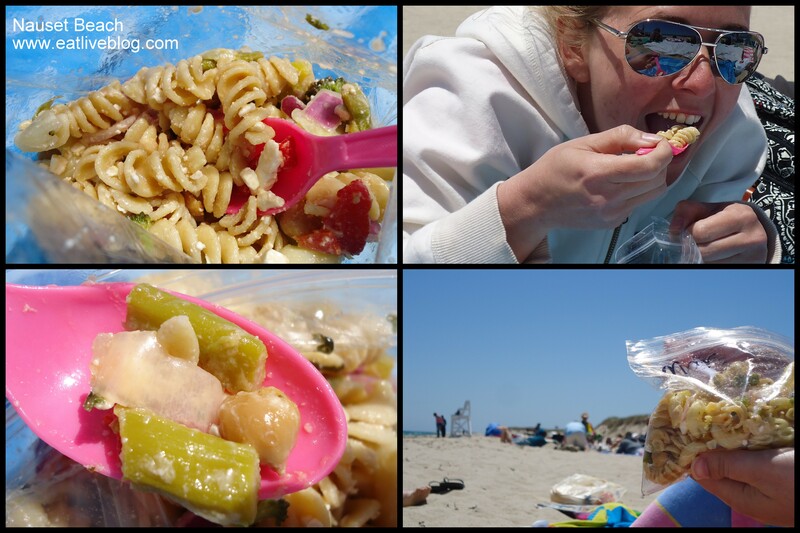 Love pasta salad – and it’s even better at the beach. Looks like you had a lovely trip! My daughter goes to school in Boston and this coming weekend she’s going to the beach with friends. I’m not sure which one but she’s very excited about it. Sounds like Alicia is a great friend!